The Gospel of John records more visits to Jerusalem by Jesus than any other of the Gospels. John is the only one to record the visit during the Feast of Dedication. BDAG translates the Greek term egkainia as “festival of rededication.” The feast is also known as Hanukkah and the Feast of Lights. What is he Feast of Dedication? This feast, observed on the 25th of Kislev (roughly our December), had its origin in the period between the testaments. The desecration of the temple by the Seleucid ruler Antiochus Epiphanes took place in 168 B.C. The climax of the Maccabean revolt was the removal of all evidences of pagan worship from the temple. An eight day feast of dedication was observed in 165 B.C., and continued to be observed annually by the Jews. At Modin, a village north-west of Jerusalem, on the way from Jerusalem to Lod, the Syrians tried to force an old priest by the name of Mattathias to offer a pagan sacrifice. The priest refused but another Jew volunteered to offer the sacrifice. Mattathias killed his fellow Jew and the Syrian officer. As word spread, Mattathias became a national hero. He was of the family of Hasmon (or Asmoneus). Thus began the Hasmoneans. Amit Re’em, an archaeologist of the Israel Antiquities Authority says all the evidence points to the fact that these graves are of Christians and pagans and that this burial site actually belongs to an ancient monastery. Read the Haaretz article here. 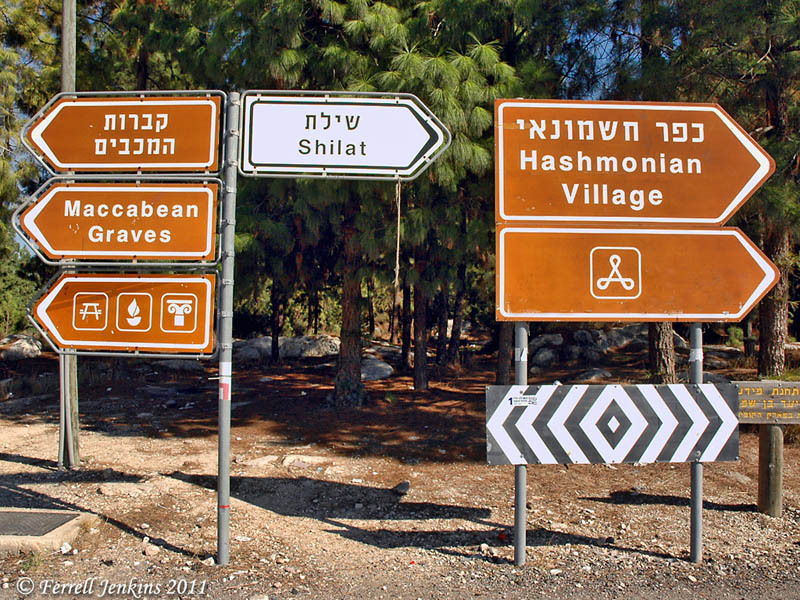 Near Modin, signs point to the Maccabean Graves. Photo by Ferrell Jenkins. Even though the Feast of Dedication was not a feast authorized by the Mosaic Law, it became part of the Jewish heritage, and Jesus came to Jerusalem at that time — at least once. Jesus cleansed the Temple on two distinct occasions. The first time is recorded in John 2:14-22. The second account is recorded in Matthew 21:12-13; Mark 11:15-18; and Luke 19:45-48. This entry was posted in Bible Lands, Bible Places, Bible Study, New Testament, Photography, Travel and tagged Hanukkah, Ministry of Jesus. Bookmark the permalink.